The days following the Italian parliamentary elections on 4 March 2018 were marked by alarmist headlines in the German and international press. However, the election outcome is not surprising given the changing attitude of the Italian electorate towards the European Union: it reflects the dissatisfaction with the economic situation, the call for more freedom for national governments and a social Europe long underestimated by Brussels. 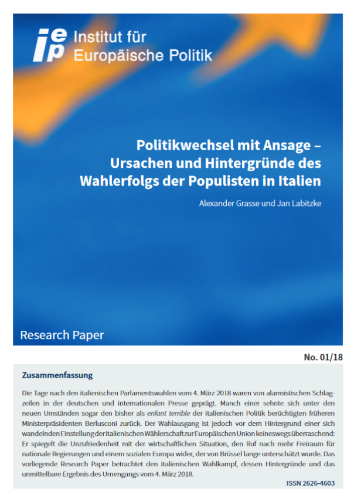 The Research Paper by Alexander Grasse and Jan Labitzke looks at the Italian election campaign, its background and the immediate outcome of the poll. Check the whole paper here (in German).